I also want to point out an excellent post written by our school’s social worker, Barb Bondioli. She reflects on her growth as an educator with the help of a familiar story and a powerful student experience. This was published on the Center for Courage and Renewal Blog. 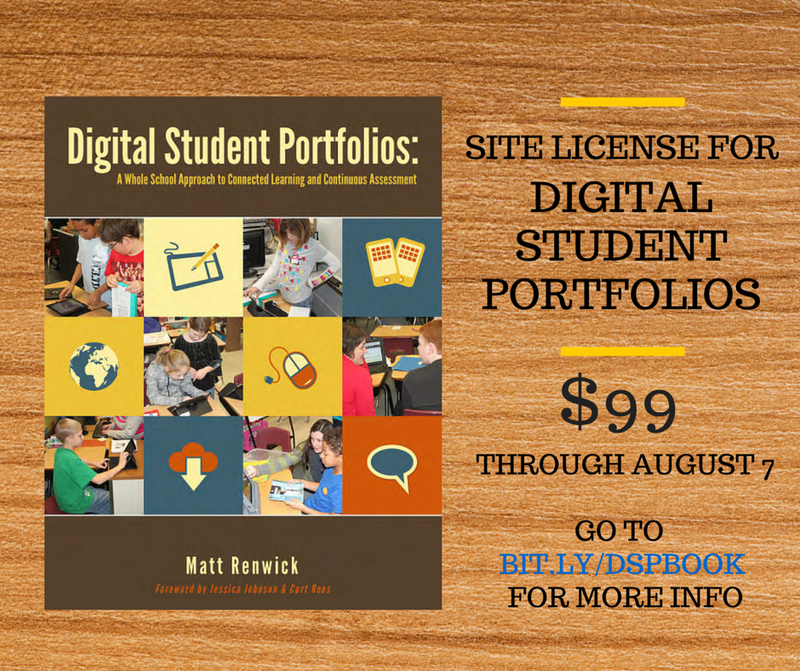 I’ve had an excellent experience guiding educators in a summer study of my book I published last year on digital portfolios. There will be little time to do this kind of work once the school year begins, so I am offering a group discount and support for schools, teams, and university instructors wanting to explore my resource during the year. For more information about this professional learning opportunity, click here. Finally, I just wanted to note something special that happened this evening. It probably doesn’t seem like a big deal at first glance, even to my kids. We were at the local public library for a performance by a national yo-yo champion. My son, always the extrovert, was selected from the sea of kids as a volunteer for the stage. His role: Hold still while the performer knocked off a red poker chip placed on his ear with only his yo-yo. My son standing still during this performance was not what I was most proud of, although that can be an accomplishment. The best part was what happened during the setup of the trick. The performer asked my son if he had ever heard of the story of William Tell. After a bit of deliberation, he correctly replied that Tell was a fabled archer who could hit an apple off the top of a person’s head with a bow and arrow. Actually, that isn’t even the best part. What was most worth celebrating was when he came back to his seat after his brief time in the spotlight. I asked him how he knew what he knew about William Tell. I read about him while checking out books in the school library. I’m sure that this love of reading came partly from my wife and I reading aloud to both of our kids nightly. It was also strengthened by the powerful literacy instruction he has received at Howe Elementary School in Wisconsin Rapids. Other influences include easy access to texts in our home and a robust classroom library. Aren’t we as educators quick to attribute student success to what we provide for our students? It’s almost second nature now, a gut reaction to this crazy cultural focus on the “value-added” instructional strategies we might utilize in our classrooms and schools. Nope. All we’ve done is read with them, check out books with them, talk about what they are reading with them, read silently with them, having books and other print laying around while we are with them. With them. Not to them. Second, I believe we don’t work smart enough. Not because we are trying to make life harder for ourselves, but that many of us don’t know yet how to prepare for powerful, daily instruction. Part of the problem is not giving teachers time for this work, along with a lack of opportunity for training in backward curriculum design and authentic assessment practices. At the same time, resources are readily available online and in print at a reasonable cost for professionals. We value what we make time for in our lives. Finally, and related to the last point, our time preparing for what’s possible in classrooms might be best spent in getting rid of outdated practices. The previous list in this post would be a good starting point, if you still use any of them. The value that is added in jettisoning what is not working for students should be just as noteworthy in a teacher’s evaluations as anything a rubric might spell out or a supervisor would expect. As a principal, it’s what I look for.